Jewish financier and chief rabbi of England; born in York before 1190; died after 1253. He was probably the son of Josce of York, the leading figure in the York massacre of 1190. 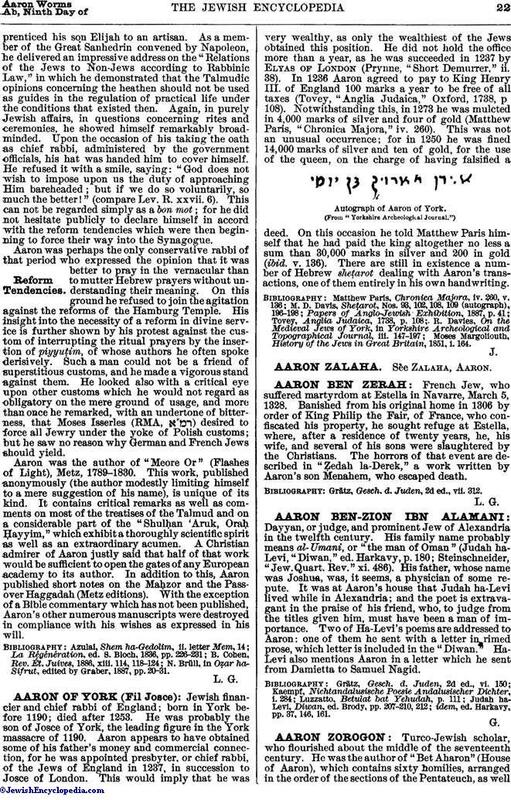 Aaron appears to have obtained some of his father's money and commercial connection, for he was appointed presbyter, or chief rabbi, of the Jews of England in 1237, in succession to Josce of London. This would imply that he was very wealthy, as only the wealthiest of the Jews obtained this position. He did not hold the office more than a year, as he was succeeded in 1237 by Elyas of London (Prynne, "Short Demurrer," ii. 38). In 1236 Aaron agreed to pay to King Henry III. of England 100 marks a year to be free of all taxes (Tovey, "Anglia Judaica," Oxford, 1738, p. 108). Notwithstanding this, in 1273 he was mulcted in 4,000 marks of silver and four of gold (Matthew Paris, "Chronica Majora," iv. 260). This was not an unusual occurrence; for in 1250 he was fined 14,000 marks of silver and ten of gold, for the use of the queen, on the charge of having falsified a deed. On this occasion he told Matthew Paris himself that he had paid the king altogether no less a sum than 30,000 marks in silver and 200 in gold (ibid. v. 136). There are still in existence a number of Hebrew sheṭarot dealing with Aaron's transactions, one of them entirely in his own handwriting. Autograph of Aaron of York. Moses Margoliouth, History of the Jews in Great Britain, 1851, i. 164.